Summer heat is often unbearable and the only way through it is with an air conditioner. 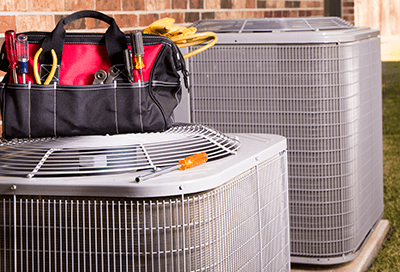 Whether you have room air conditioners that install in the windows or a whole-house central unit outside, learn how to keep them running in top shape throughout the season with these handy AC maintenance tips. If you have a central AC unit, it will always be located somewhere on the outside of your home. It consists of two basic parts: the outdoor unit, which is the compressor or condenser; and an indoor unit that’s located in a central duct somewhere near your furnace. For those whose heating system consists of a heat pump instead of a furnace, the indoor unit will be in the air handler. Whichever type of AC unit you have, it’s always a good idea to read through the owner’s manual to familiarize yourself with the air conditioning components of each unit. If you need to replace parts, we always carry all of the HVAC parts and supplies you need. This is one of the simplest AC maintenance tips we have. Keep leaves and brush away from the top and sides of the AC unit. You may want to vacuum the fins on the outdoor unit, but do so gently to avoid anything being crushed or bent. Some units require you to unscrew the top metal portion of your AC unit to get at the parts to be cleaned. Again, being familiar with your user’s guide goes a long way here. Large central AC units always sit on a concrete pad and sometimes they crack or even begin to sink into the ground they are on. Because an AC unit tends to settle over time, it may happen that the pad is in need of some repair. If the concrete pad is slightly sunken, and as long as no electrical lines or copper coolant tubes have been affected (those large wires which run from the unit into your house), you may not have to do anything at all. If puddling occurs or wires are drawn tight, it might be a good idea to level off the concrete pad. You can do this by working a long board under one end of the pad, lifting it gently and placing sand underneath. This is one of our tougher AC maintenance tips, so if the concrete pad breaks, it’s best to call in an AC professional for best results. Having a programmable thermostat is the only way to go given today’s technology. These allow you to set temperatures at different times of the day or night and each action is done automatically. If you are out a good portion of the day, raise your temperature so your AC unit doesn’t have to work so hard. It’s best NOT to turn it off altogether. Programmable thermostats mean a lot less tinkering around by you and with a smartphone app you can change settings anytime you need to. Believe it or not, there are unscrupulous salespeople out there who would sell you the Brooklyn Bridge if you’ll have it. You don’t need a huge outdoor unit for a smaller home. AC units are carefully sized to the number of cubic feet they will be cooling. The same holds true for a smaller unit for a larger home; it will work too hard and probably struggle to keep your home cool. Know what you have and what you need. This is definitely not for everyone, but if you know your way around electricity and are familiar with AC units, you can make the same types of repairs that an HVAC repair technician will make. Especially if it’s the height of a heat spell, you may be waiting days for a repairman. Most repairs can be made for about $50 worth of HVAC parts and supplies and will take a few hours to do. This type of repair can save you a lot of money but only if you are fully comfortable with doing things like spring HVAC maintenance yourself. For smaller window AC units, you can clean the exterior portion of the unit by scrubbing crud off of the outside of the unit. Use a plastic bristle brush and a foam cleaner. If AC units are old and should be replaced, don’t assume you can just put them out with the trash. Towns and cities have specific regulations for things like large appliances and electrical and computer units. Find out through your local waste management company what you need to do. Also known as a whole-house fan, this type of fan will help to cool your home and give a boost to your central AC unit. A fan mounted in the attic pushes hot air out through attic vents and draws cooler outside air in through open doors and windows. Without your AC unit on, this creates a quick air exchange throughout your house, which you can feel when the breezes come in through the windows. Of course, there are times when only a professional will do, but proper maintenance and using the right tools and supplies will keep your machinery running for longer. Follow these AC maintenance tips to keep a cool home and a cool head.